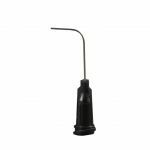 Jensen Global ESD Safe 90° Angled Dispensing Needle Tips are ESD safe Dispensing Tips eliminate the danger of high charges generated by conventional dispensing needles. These premium 90 degree angled dispensing needles are available in a box of 50 or bulk bag of 1,000 pieces. Please contact us for additional lengths and gauge options. Jensen Global ESD Safe 90° Angled Dispensing Needles are available in boxes of 50 or bags of 1000. Note: Our Jensen Global ESD Safe 90° Angled Dispensing needle tips are intended for industrial use only. They are not sterile and should not be used for medical purposes. Purchase Jensen Global ESD 90° Angled Despensing Needles Today!